Alan Chrisman of Get Back! Records in Westboro has been in the used record business since 1972. Mr. Chrisman says he wants to show kids what music was like before CDs. Spin Doctor Alan Chrisman tries to keep vinyl alive. Vinyl, you remember that. You know, the round black stuff you dragged across and out come the sounds of the Stones or Frank Sinatra. Well, down on Richmond Road in Westboro, Alan Chrisman is keeping the memory alive. For the past 27 years in various locations, the 52-year-old Mr. Chrisman has been buying and selling used vinyl. His "Get Back! Records" just west of Churchill Avenue features classic and not-so clasic discs from as far back as the '50s and beyond. He even has an 1898 Edison wax cylinder on which music was recorded. "I do this to show the youngsters that there was something before CDs," Mr. Chrisman, said. There can't be too many places like Get Back left. In many ways it is like a combination of record store and basement recreation room circa 1970. The vinyl is neatly filed in Sealtest milk crates. The discs cost between $5 and $20 except for the occasional classic. The walls feature pictures of the Beatles and in particular, the four photos of the Beatles that were packed in the bands' white album (Mr. Chrisman's favourite Beatles disc). And the records, well just try to get these at HMV or Sam's. There's Bobby Vee meets the Crickets; Alan Freed's Rock 'N' Roll Dance Party; Chubby Checker's For Teen Twisters Only; Paul Anka's 15 Songs; the Everly Brothers; the Righteous Brothers and Peter and Gordon. Why there's even Vincent Edwards (you know, the guy who played Ben Casey on television) at the Riviera. Between the milk crates, there are classic discs with labels such as Decca, eight-track tapes and old turntables for sale. And inside the store, which features a hand-drawn sign by the front door, is a fetching green shag carpet, rather like the one your father used to like. "I don't want to stop being a kid," Mr. Chrisman said. The Westboro resident still manages a rock band and has a stall at the Stitsville Flea Market when Get Back is closed. He opened his first record store and bookstore at Somerset and Booth streets in 1972. That led to a series of similar ventures plus a coffee house and an alternative newspaper. Into the mix of album-selling and rock-band-managing, Mr. Chrisman also organized two Beatles conventions at the Ottawa Congress Centre in 1995 and 1996. 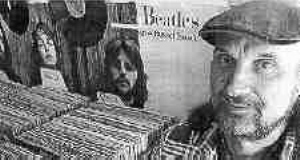 One of them featured first Beatles drummer, Peter Best. "I haven't sold out," he said. "It just seems natural to me to just do my own thing." In many ways, Mr. Chrisman seems to miss the '60s, though he says he remains current with today's rock and news events. "It was a time of innocence, a time of hope. You thought you could change the world." He still looks the part of the '60s stereotype. The six-foot-two-inch storeowner keeps his dark hair at shoulder length and capped with a flat blue hat (he calls it his musician's cap). Cord jeans, sneakers and a flannel shirt complete the '60s fashion statement. Mr. Chrisman chose Westboro area for this store because Richmond Road there looks very much like a 1960s downtown. That and he hoped to get some clientele that frequents the '50s mecca, the Newport, to buy his used and classic records. "I'm my own man," Mr. Chrisman said.